Whoops! Sorry I'm late today! My apologies for any inconvenience caused. Also, before I get into today's post, I just want to say a HUGE THANK YOU to you. Yes, you! For participating in the Christmas Spectacular in any possible way - whether you only read this post; or you've participated and wrote your own; linked up; shared the event with your friends; whatever it is, thank you for sharing the love! I promise I'll eventually answer your comments and return owed visits and follows. Please bear with me. Work is trying to eat me alive busy for me at the moment. So how are you going with your Christmas shopping? Started yet? Finished already? I hope you're not stuck for ideas. But if you are, I hope my wishlist here will inspire you. Courtney Stripe Scarf from Cotton On: How cute is this scarf? Not too sure why it says it's neon coloured on the page, looks more pastel to me. I just love the colours. It looks light and summery too. Tea Metallic Gold Sandal from Cotton On: I've had one of these before, and they were the bomb. So comfortable. I have other plans for these though when I get my hands on them. I saw this cool upcycle project on Pinterest that I want to try. Fuschia Leather Travel Doc Wallet from Kikki-K: this one's a bit unusual for me. I rarely go for really bright colours. It just looks so gorgeous though! Goals Journal from Kikki-K: I love the journal series that Kikki-K has. I'm currently doing the Happiness one, and I've seen such a big improvement in me for the past month. Coachella Cross Body Bag from Cotton On: I've been trying to find a cross body bag that's not too small, not too big. This one's a bit tricky, since the site doesn't specify the size. But I just like how simple it looks. 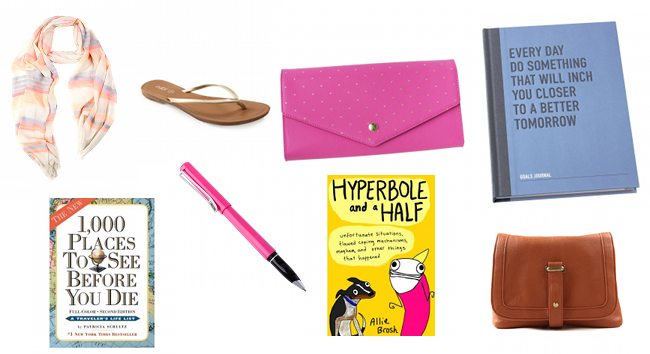 Hyperbole and a Half by Allie Brosh: Please tell me you've heard of Hyperbole and a Half. If you haven't, go there. Today. Now. Do it. I cannot wait to get my mitts on this little gem of a book! 1,000 Places To See Before You Die by Patricia Schultz: I find the title macabre, but I would love to see which places they suggest, especially the ones for the USA and Europe. What are you wishing for this Christmas? Are they mostly material things? Or are they experiences? i was pinning a wishlist onto pinterest.. but maybe i should blog it too! :) hope you get all you wish for this xmas! I love the Coachella bag. Hope you get it for Christmas! 1000 places to see before you die sounds interesting. Following from the blog link up. Love Hyperbole & Half! And that bag would match my boots perfectly! Have you read it? I can't wait to get my hands on that book! Thanks SD :) yes I remember flicking through that book a few years ago, it looked really good. I loved your ABC. It was very clever :) My bestfriend just told me she's gotten me the previous version of the goals journal, I'm so excited! I'm running a month long "New Year, New Me" blogging challenge, and even though I've already planned the topics, I'd love to compare them to what's written on the journal. I know right! :D by the way, totally love your profile picture. Your hair looks so cool! Thank you :) That's cool. That would be interesting.